Its rare to get something valuable for nothing. But this October, there’s a week of more than 40 events featuring top-flight views of marketing by some of the best in the industry. And since they’re free, the best sessions will fill quickly. There’s simply no substitute for the energy and relationships you get at a great digital marketing event. I developed an life-long addiction to being part of communities that push the digital horizon, as the promoter and publisher behind 70 monthly technology events for the old Boston Computer Society. MITX, one of the top internet marketing and business associations anywhere, convened this week-long showcase of the region’s marketing and innovation talent. Its called FutureM, and if you’re interested, it’s time get on your schedule. This line-up of enterprise digital strategists hasn’t yet been broadly announced. Each participant runs a team that is the very best in its respective industry. They know how to sell investment, generate change, and drive business outcomes. You won’t hear worn-out truisms that were cool in the ’90s about “thinking like a publisher.” People responsible for leading real marketing innovation will talk about their jobs, challenges, and opportunities for building business online. Come and join in the fun. Everyone likes tossing darts at the future; someone’s going to nail it. The moderator, Jeff Cram, is the Chief Strategy Officer for ISITE Design. He has conceptual finesse and the kind of curiosity that will make him ask really revealing questions. His sneaky niceness makes him impossible to evade! Here’s a direct link to register for The Future of Digital Strategy. If you do come to this session, please stop by and say hello. I’ll have a tasty gift that, as my friends and ISITE might say, “is just barely worth the effort.” If you’re at this event simply come say hi and mention the blog. 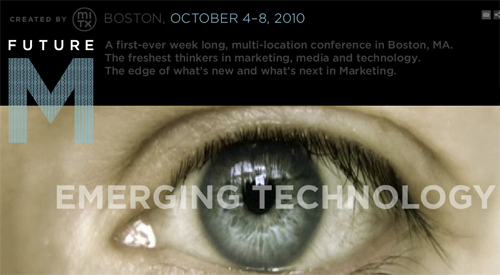 Hope to see you at FutureM. 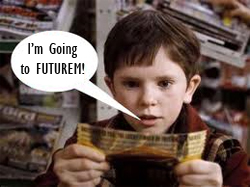 1 Response to "Early Notice: Don’t Miss The Future of Digital Strategy at FutureM in Boston"